With the Holiday Season just around the corner. Its a great time to remember that the holidays are about enjoying your family, friends, food, traditions, and so much more. It is easy to use the holidays as an excuse to over indulge and loose track of how hard we have worked towards our goals through out the the year. 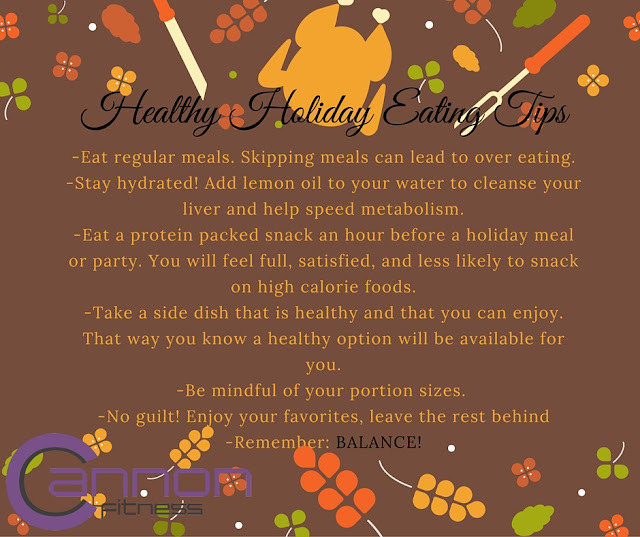 So here are some healthy holiday eating tips to help you make it through this Holiday Season and stay on track! The most important thing to remember is that life is a balancing act. Don't deprive yourself, instead treat your self to your favorite indulgences and feel satisfied with your choices. Stay active each day to keep your metabolism boosted and energy high!